After gathering up the courage to leave a job that was definitely not for me, I have decided that it’s time to take a chance and go out on my own for a while. The reason for this leap of faith is that I have recently been on countless job interviews and have yet to find a role that I feel is the right next step in my career. So, I figure that taking on a few short-term contracts is the way to go. I’m hoping that I will have the chance to be exposed to new roles that I would never have had a chance to try out as a full-time employee. Luckily, I live in the fabulous city of Toronto – where new start-ups and entrepreneurial ventures are popping up all over the place. I’ve decided to document the challenges that I am facing as a budding entrepreneur who is trying to start my own freelancing business. To get my first gig, I have reached out to a lot of people who I have worked with in the past. I figure that people who know what it’s like to work with me and the quality of work that I put out is the best place to start. From there, I’m hoping that I will be able to get new clients as I will have built up my experience. I have been experimenting with a number of social media tools like Twitter and LinkedIn and have discovered a lot of new companies and other entrepreneurs in the Toronto area through these platforms. I also recently attended a “SproutUp” event in Toronto to hear from other entrepreneurs and get some inspiration about what works in regards to promoting yourself and staying true to what you have to offer to the world. If you haven’t heard of Sprouter.com, definitely check them out. They have “SproutUps” every month in Toronto and have an online social media platform to connect with other budding entrepreneurs. The energy in the room at the “SproutUp” was infectious and I really feel that Toronto is just ripe for growth in the start-up arena. It’s a very exciting time to be living here! This week, I’m also teaching myself how to use WordPress. Hello world! I’m also interested in learning more about the tools that work with Twitter and how I can track my tweets and followers more efficiently. I feel like a new University graduate again and am trying to get my first break! It sounds funny but I feel more alive in my career now than I ever did in previous jobs in the past. 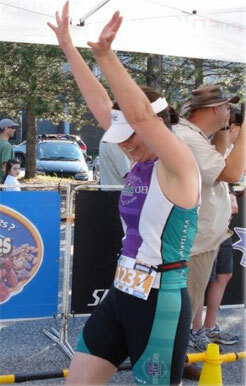 I would equate this feeling to training for my first ever triathlon. I know that it’s going to be a long road ahead but if I stick to my plan and persevere, I can reach the finish line! Stay tuned for my next blog post. I’ll let you know how some of my exploratory meetings with former colleagues go.